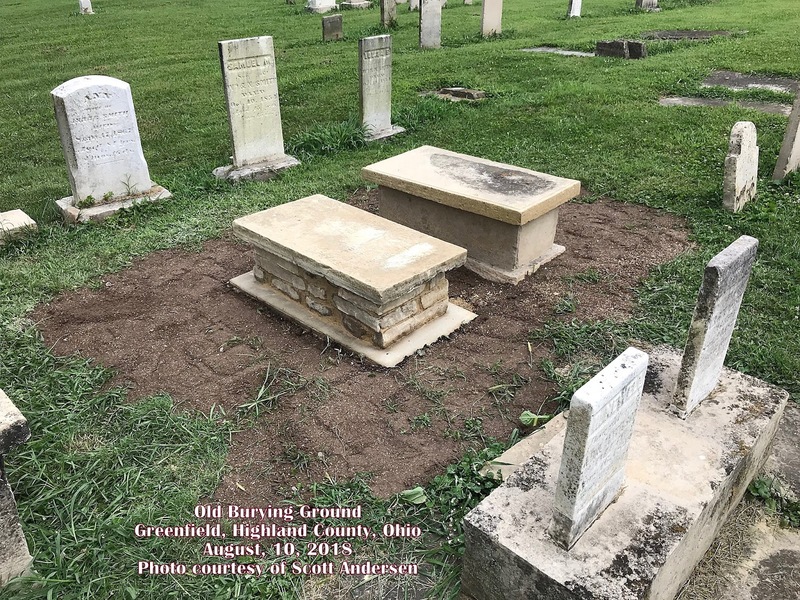 The Greenfield Historical Society in historic Greenfield, Highland County, Ohio has announced that its first preservation session at the Old Burying Ground for the 2019 season is scheduled for Sunday, May 5th, beginning at 9:00 a.m. 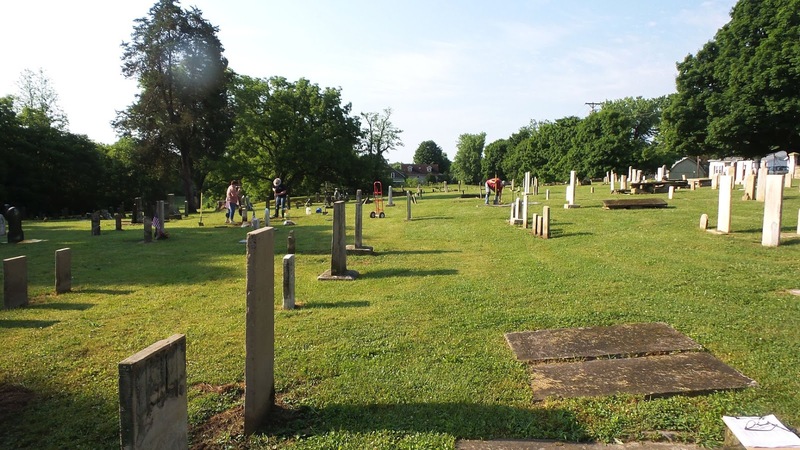 This dedicated group of volunteers will be embarking on its 6th year with its hands-on work cleaning, repairing, and re-setting all of the various types of gravestones and monuments that mark the grave sites at this unique pioneer Ohio cemetery. 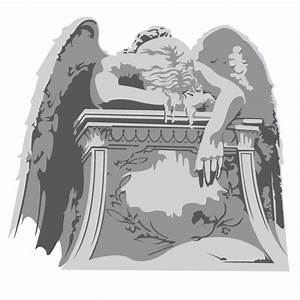 As in the past, like-minded volunteers are welcome to join them! Please visit the Greenfield Historical Society on Facebook too! 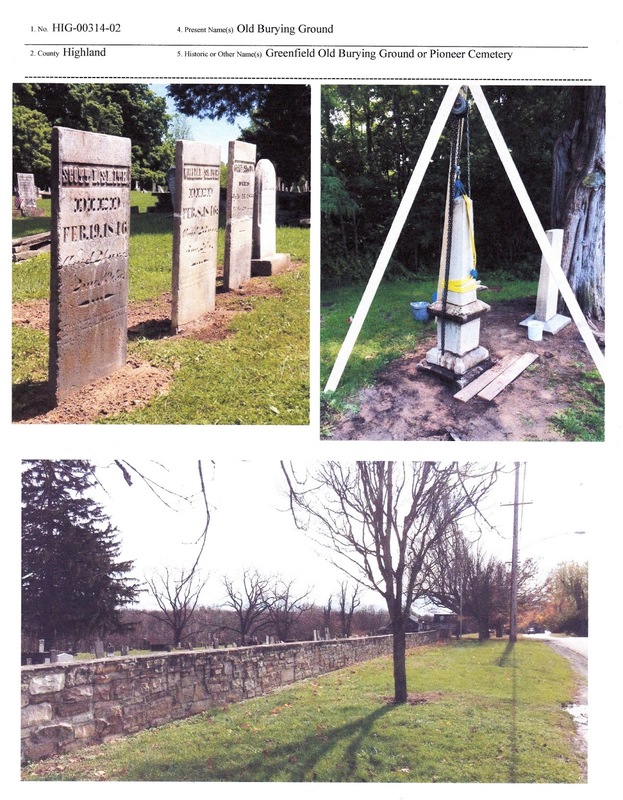 John King and Scott Andersen were undaunted by the threat of rain on the last day of October, 2018 to proceed and conduct a work session where over a dozen gravestones were repaired and restored by them. 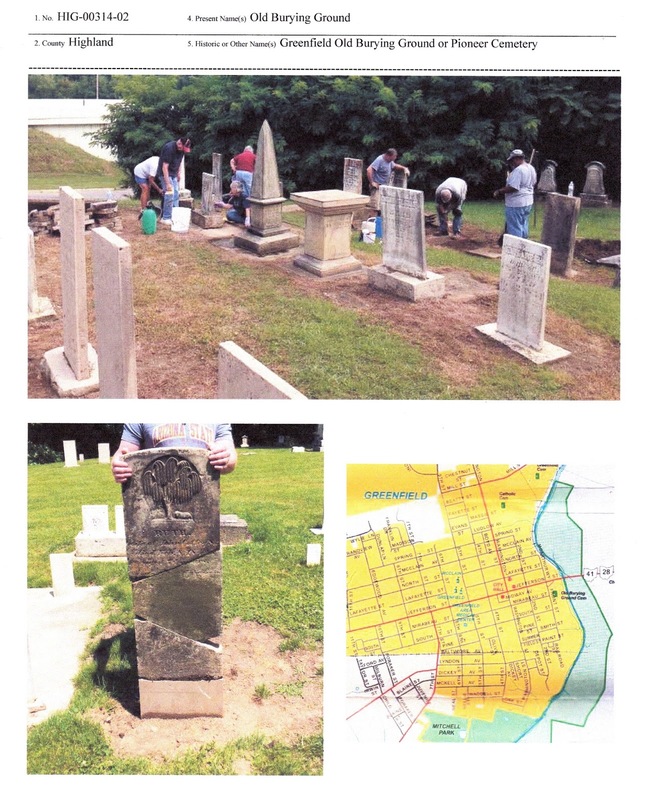 Below are ‘sneak peek’ photos which illustrate the type of preservation work that John and Scott, and other volunteers from the Greenfield Historical Society, have undertaken throughout their 5-year total restoration project of Greenfield Ohio’s earliest burial ground. 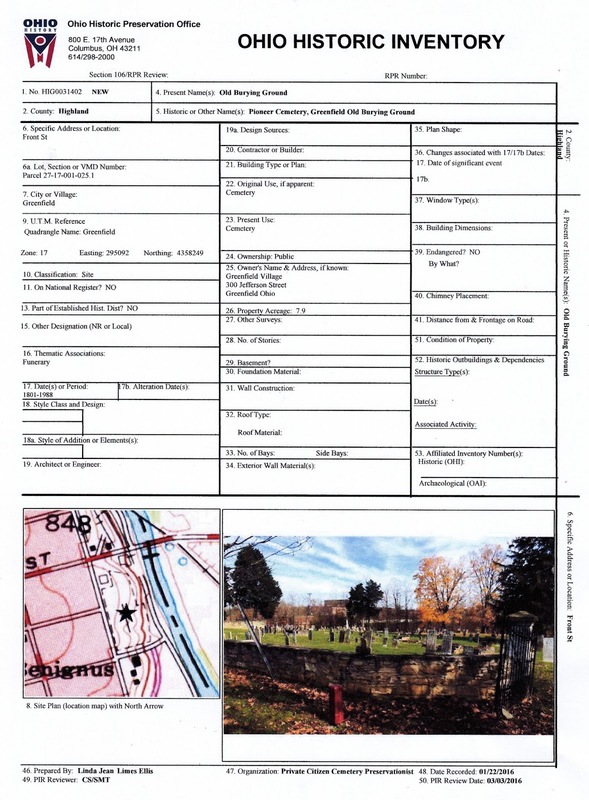 The historic cemetery is adjacent to the historic Travellers Rest. “Halloween turned out to be another productive morning at the OBG. Although it looked like rain would drown us out, we managed to work on over a dozen stones before quitting just minutes before rains came. 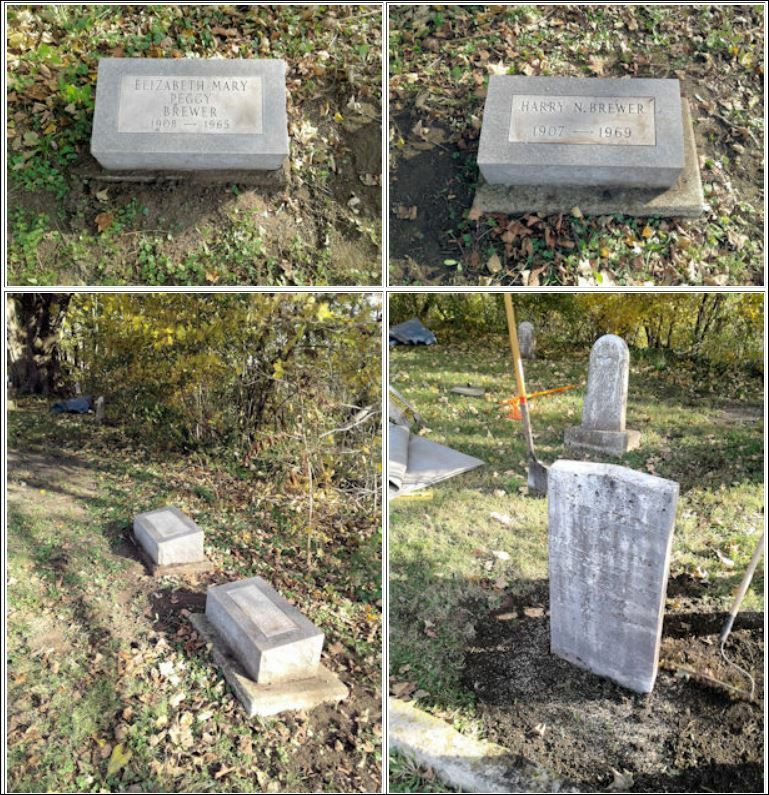 Scott Andersen and John King leveled and straightened tombstones and planned for the next area to address in the cemetery. Venus Andersen stopped by to offer encouragement and bring us soft drinks. This might have been the last session for the year, but maybe with a break in weather later in November or December we might be able to do some more work in 2018. This was probably one of the more productive years at the cemetery! 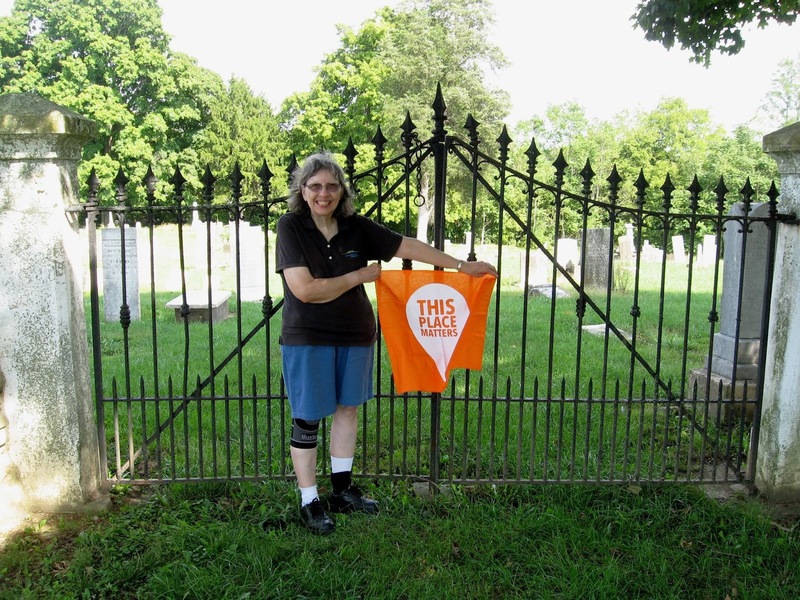 many with grave marker photos! 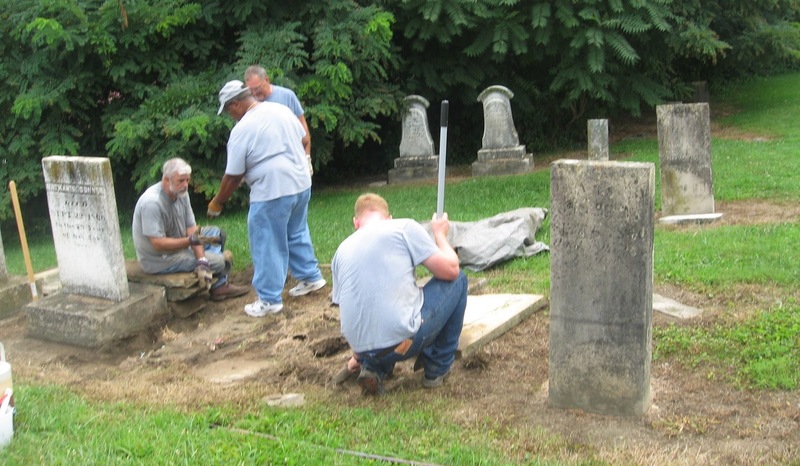 Congratulations to Scott Andersen who has done a fantastic job of restoring these box tombs seen in this photograph. The one on the left with its sides of individual stones is the more intricate of the two. As we can also see, the dirt area around these box tombs has been tamped down to make it ready for grass to be planted. 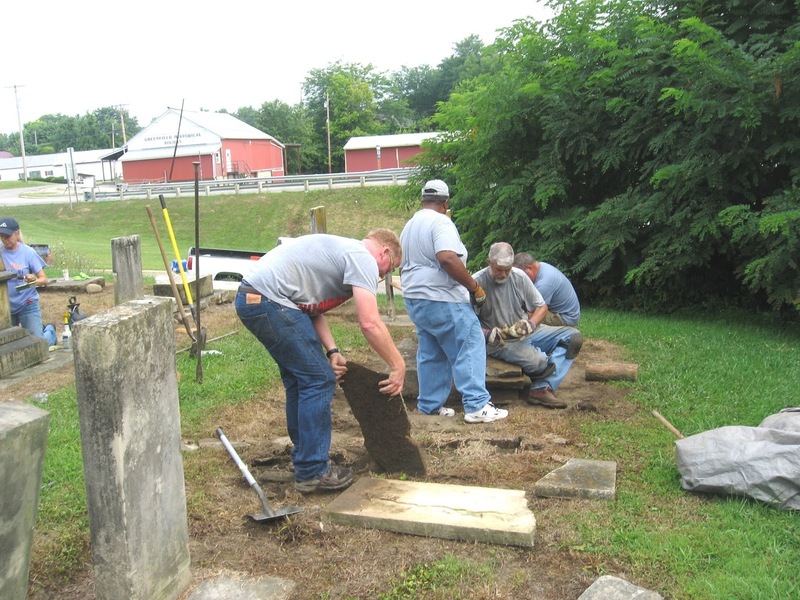 We know that tombstones and monuments need grass around them to add ground support so they do not start to lean. Without grass they can eventually topple over. 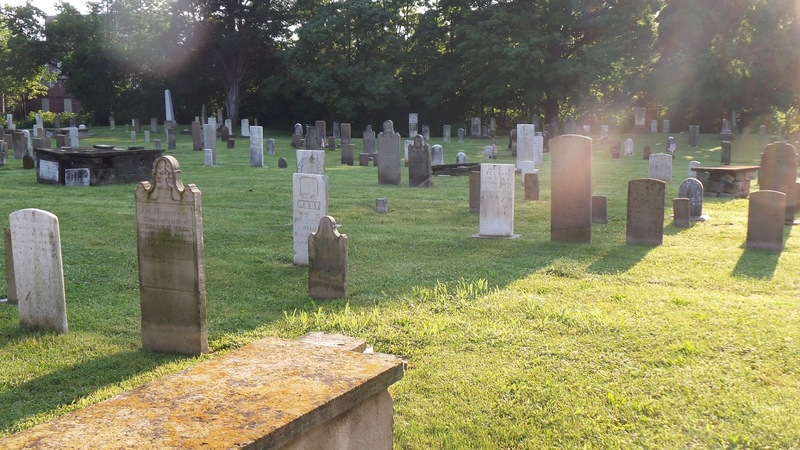 One of the big mistakes cemetery groundskeepers make is to over-weedwhack around a gravestone, leaving a large circle of just dirt around it. As we can see from the markers sitting in slotted bases and some installed directly into the ground, the grass around them not only looks good, but is helping to keep them upright. 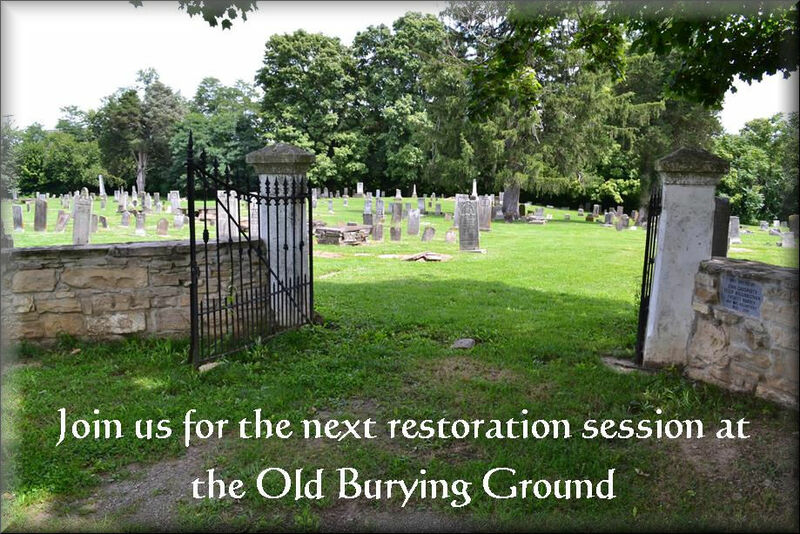 Restoration work at The Old Burying Ground is now in its fifth year! 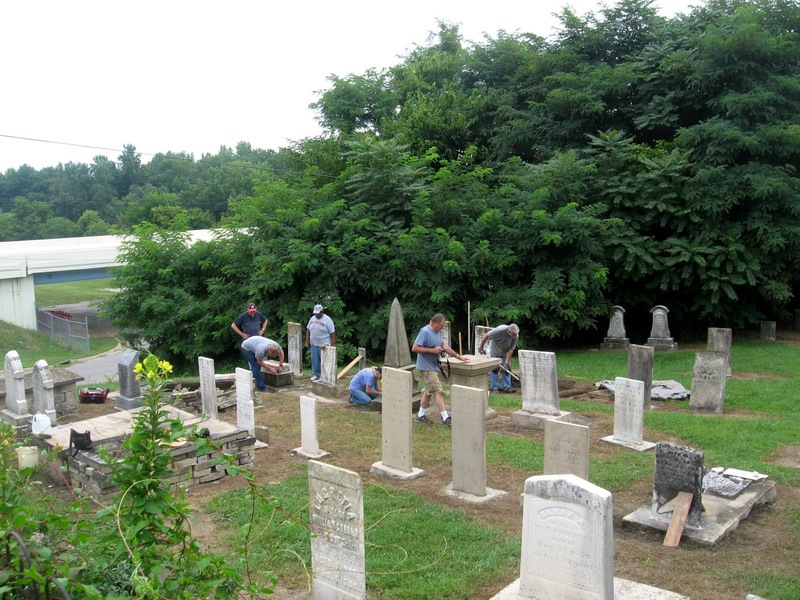 Almost monthly during the Spring and Summer months organized day-long work sessions are held to revitalize this early Ohio cemetery. 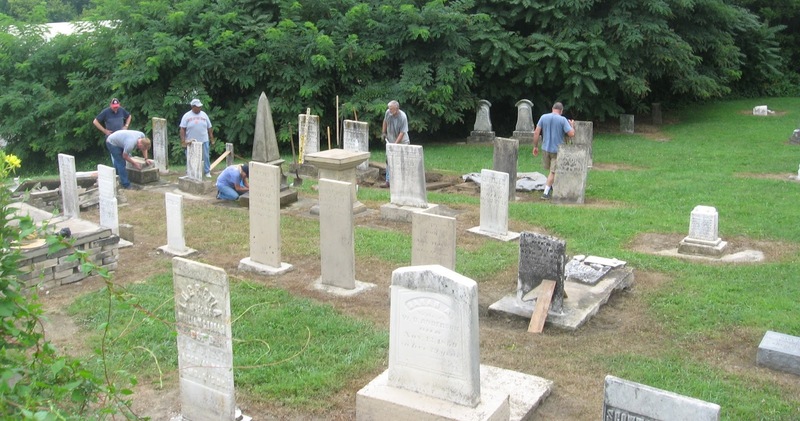 Improvements come one grave marker at a time as the dedicated volunteers work carefully row by row. The transformation has been phenomenal! Indeed the volunteers of the Greenfield Historical Society, and others who have so kindly volunteered with them, have much to be proud of! The results of their work now sit impressively right in front of their eyes. It is a treat to visit the “OBG” – and to view the photographs showing all of their progress! 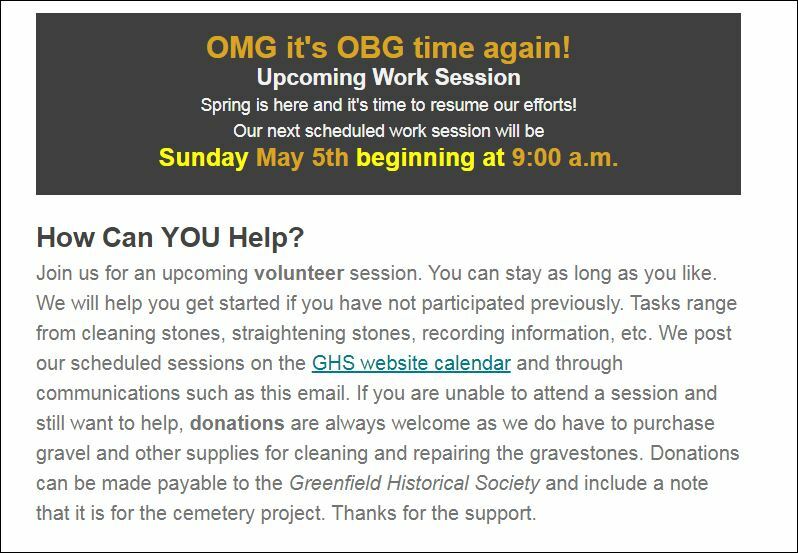 Reminder: The Next Volunteer Hands-On Cemetery Preservation Work Session at Greenfield’s earliest cemetery, The Old Burying Ground, will be coming up on Tuesday, May 15th, 2018 beginning at 9:00a.m. — it is a “stay as long as you can environment”. 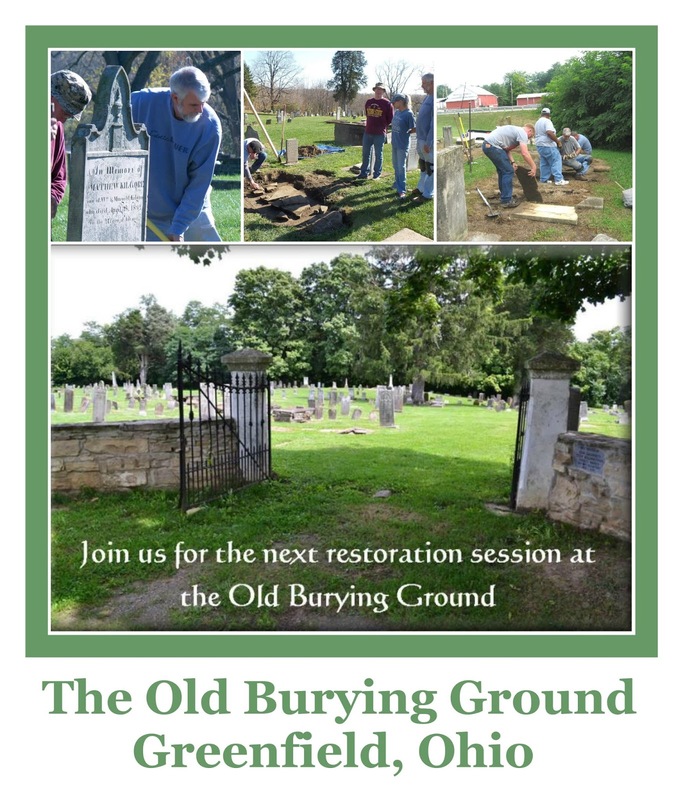 The Old Burying Ground’s restoration/preservation efforts are now in their 5th year…and still going strong!! 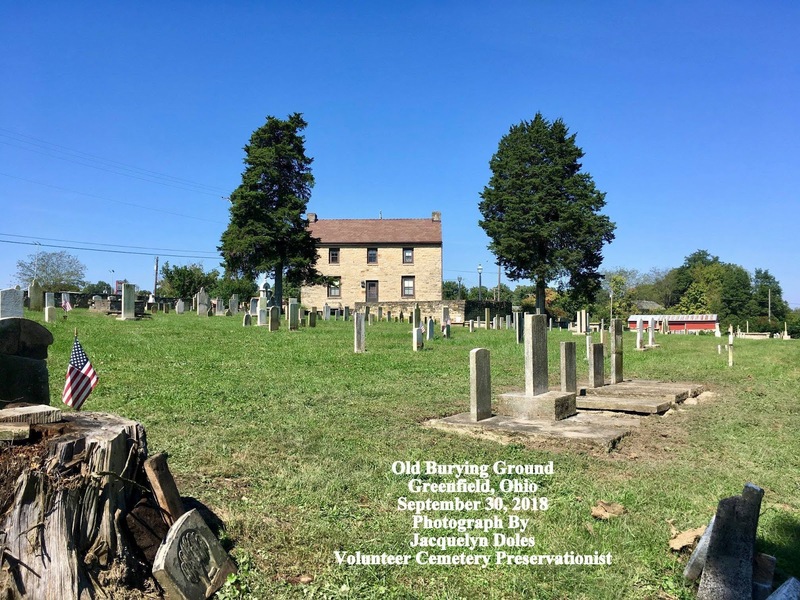 Many of the historical society’s volunteers, namely, John King, Scott and Venus Andersen, Harold Schmidt, and Gloria Losey, have been volunteering since the beginning. 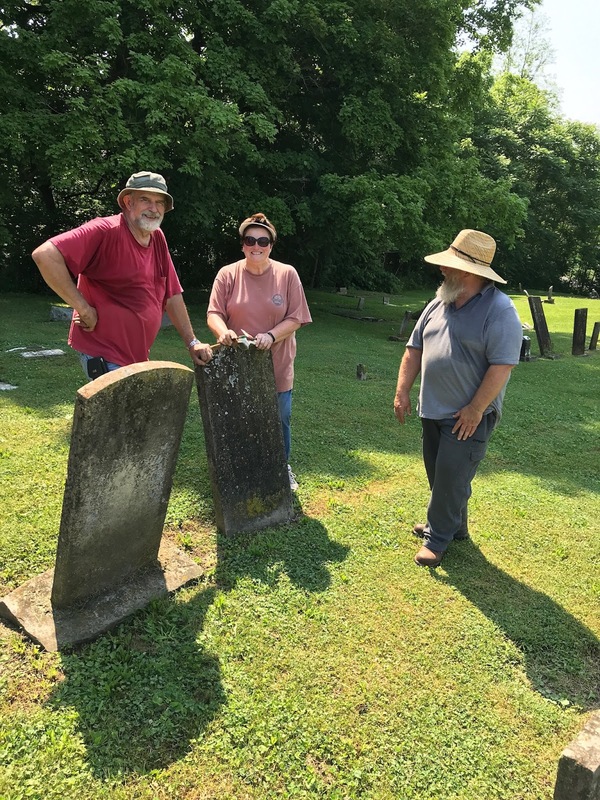 Others have also joined them over the past years, including, Michael Lee Anderson and Jackie Doles, who are regulars as well. 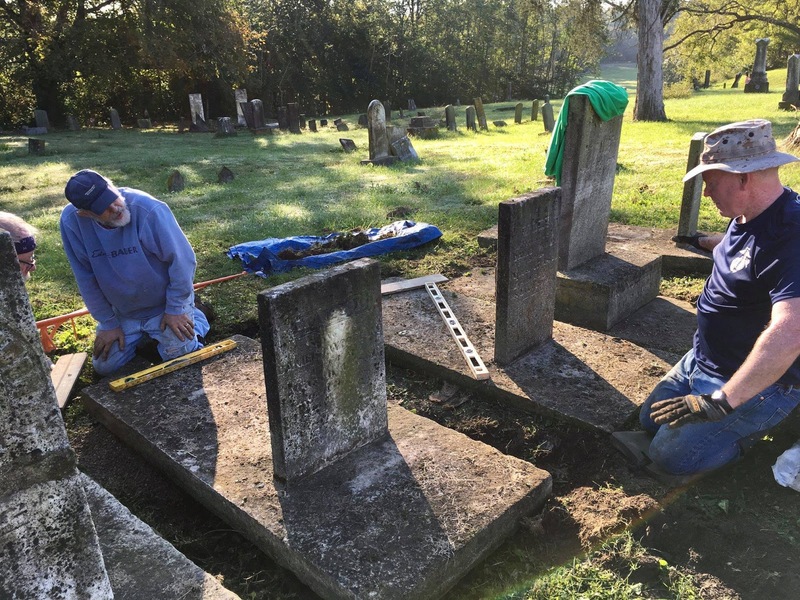 You won’t find a more dedicated, and experienced group of caring individuals who are working to restore an early Ohio cemetery than these volunteers! 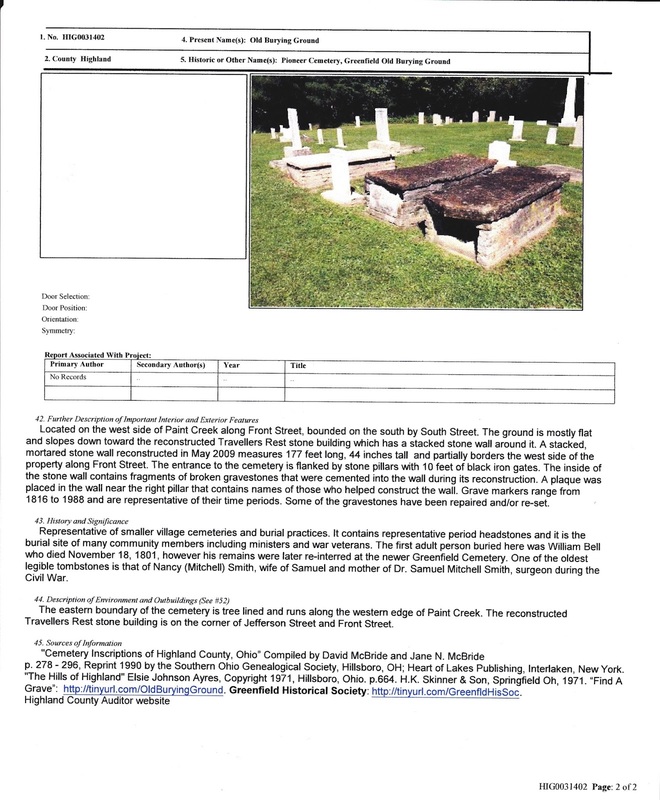 The Old Burying Ground’s Ohio Historic Inventory # HIG-00314-02 with the Ohio History Connection’s Preservation Office. 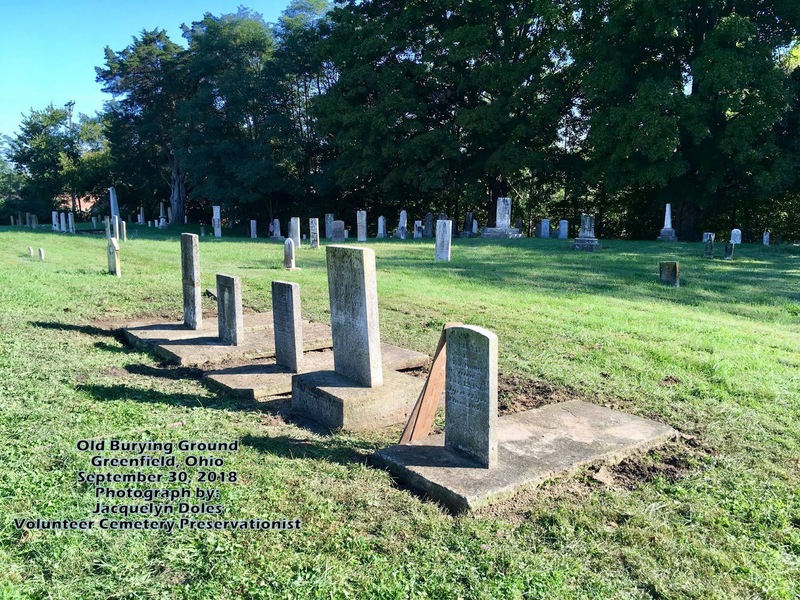 Recalling how life was 130 years ago in Greenfield, Highland County Ohio, where many of the Limes ancestors lived in the village — and not far from it — in both Highland and Fayette Counties. This snippet from the “Greenfield” column includes a tidbit about Mrs. William Limes. The Mrs. William Limes in this story was Savilla Jane Beals (Beals was often shown as Bales back then; and so we see it in this instance.) 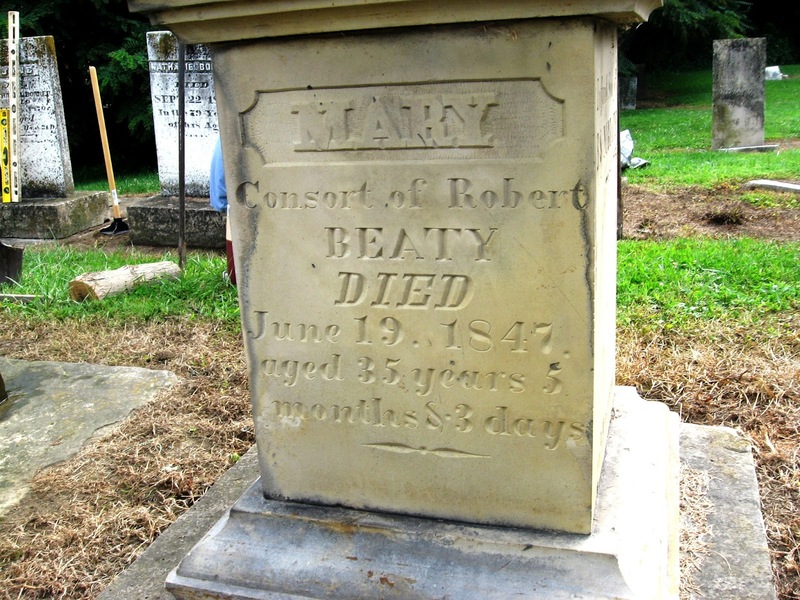 Her father was Noble Beals and her mother was Margaret Ann Berry Beals. Savilla Jane was married to William Limes II. Their first-born child was named Noble Harrison “AKA Harry” Limes. Included are the rest of the Greenfield news items of the day. Greenfield is the second largest city in Highland County after the county seat of Hillsboro. Hope you enjoy the look back!